To Cite: Fakharian E, Mohammadzadeh M, Behdadmehr S, Sabri H R, Mirzadeh A S, et al. Repetitive Traumatic Brain Injury in Patients From Kashan, Iran, Trauma Mon. 2016 ; 21(4):e23869. doi: 10.5812/traumamon.23869. Background: Traumatic brain injury (TBI) is a worldwide problem, especially in countries with high incidence of road traffic accidents such as Iran. Patients with a single occurrence of TBI have been shown to be at increased risk to sustain future TBI. Objectives: The aim of this study was to present the incidence and characteristics of repeated TBI (RTBI) in Iranian patients. 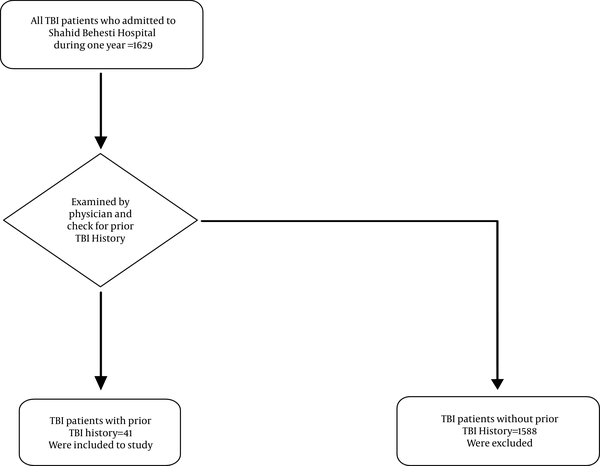 Patients and Methods: During one year, all admitted TBI patients with prior TBI history were enrolled into the study. In each patient, data such as age, gender, past medical history, injury cause, anatomic site of injury, TBI severity, clinical findings and CT scan findings were collected. Results: RTBI comprised 2.5% of TBI cases (41 of 1629). The incidence of RTBI per 100,000 individuals per years was 9.7. The main cause of RTBI was road traffic accident (68.3%); 9.7 % of cases had preexisting seizure/epilepsy disorder; 36.6% of patients with RTBI had pervious ICU admission due to severe TBI. Ten patients had Glasgow coma scale (GCS) ≤ 13 (24.4%). Seizure was seen in seven patients (17.1%). Thirty-nine percent of patients with RTBI had associated injuries. Eleven patients had abnormal CT scan findings (26.9%). Conclusions: Considering the high incidence of trauma in developing countries, RTBI may also be more common compared with that of developed countries. This mandates a newer approach to preventive strategies, particularly in those with a previous experience of head injury. Traumatic brain injury (TBI) is a worldwide public health problem which can result in long-life disability. In Iran, the incidence of TBI is 56.3/100,000, 30% of which results in disability (1). Patients inflicted with TBI have been shown to be at increased risk to sustain future TBI (2, 3). In spite of several studies regarding single occurrence of TBI in the past decades, there are very limited data about repetitive TBI (RTBI), especially in developing countries (4-6). Almost all the studies in this field are about incidence, patterns and complications of RTBI in athletes (soccer players and boxers), with an incidence of 5.9% to 36% (7, 8). Saunders et al. retrospective cohort study in USA showed that the rate of RTBI was 4.2% and prior TBI severity and epilepsy/seizure disorder seemed to have a significant relationship with RTBI (5, 6). This gap of data is very significant in our country, so that in spite of many studies regarding TBI in different parts of Iran (1, 9-11), there is no study considering RTBI. This gets more serious when we note the high incidence of road traffic accidents (RTAs) which logically can result in repeated incidence of injuries. The aim of this study was to present detailed information on RTBI in Kashan, Iran. Kashan with a population of 420780 (376138 urban, 44629 rural) is located in the central part of Iran. Shahid Beheshti hospital of Kashan University of Medical Sciences is the only trauma referral center in Kashan with 7000 annual trauma admissions per year. In a longitudinal study during one year (March 21, 2012 to March 21, 2013), all the patients with traumatic brain injury who were admitted to the emergency department of Shahid Beheshti hospital were examined by a physician in emergency room and also investigated for prior history of TBI, based on patient’s self or family report as well as previous patient's medical records (Figure 1). All the RTBI patients underwent brain CT scan study for evaluating probable TBI structural injuries and were examined by a neurosurgeon. Patients who died in emergency department were excluded. Data including demographic data (age, gender, occupation, residence area, education level, insurance status, past medical history, and accident location), TBI severity, injury cause, patient's signs and symptoms, CT scan findings, duration of hospital stay, and ICU admission were recorded. TBI severity was classified using Glasgow coma score (GCS). Injury causes were defined by international classification of diseases, 10th revision (ICD-10), external causes of injury codes. Quantitative data were expressed as mean ± standard deviation (SD) and qualitative ones were expressed as frequency and percentage. For statistical analysis, SPSS version 17.00 (SPSS Inc., Chicago, IL, USA) software was used to calculate chi-squared test, chi-squared distribution, and odds ratio. P value less than 0.05 was considered significant. A total of 1629 patients with head injury were hospitalized during the study period and 41 cases had prior history of TBI (2.5%). Since Shahid Beheshti hospital is the only trauma and neurosurgery center in the region, to our knowledge, there was no other case of single or repeated head injury that would not have been recorded. Considering this data, it can be concluded that the incidence of single occurrence of TBI was 387/100,000 (398/100,000 in urban and 288/100,000 in rural regions). The incidence of RTBI was 9.7/100,000 population (9/100,000 in urban and 15.6/100,000 in rural regions). The mean age (± SD) was 36.6 (± 20.6) years and males were more commonly (97.2%) involved than females. Eleven patients were under 24 years old (26.8%). The education level of 63% of patients was under high school diploma. Twenty eight patients (68.1%) were transferred to hospital by emergency medical service (EMS). Ten patients (24.4%) had comorbid medical conditions. Four patients had preexisting seizure/epilepsy disorder (9.7%). Fifteen patients had pervious ICU admission due to prior severe TBI (36.6%). Thirty-nine percent of patients with RTBI had associated injuries. Table 1 shows the characteristics of patients with RTBI. Abbreviations: EMS, emergency medical service; ICU, intensive care unit. Values are expressed as No. (%) or mean ± SD. The main cause of RTBI was RTA (68.3%) and motorcycle-related accident comprising 41.4% of all the causes. Twenty-two patients who were traumatized in RTAs were drivers (78%). Patients with RTBI in RTA were younger compared with the ones who had sustained RTBI due to other causes. The mean age of patients in RTA and other causes were 32.3 and 44.8 years, respectively. Table 2 shows the causes of injuries in patients with RTBI. Headache was the most common symptom (80.5%) and post-traumatic amnesia was the most common sign (36.6%). Seizure was seen in 7 (17.1%) patients. Ten patients had GCS ≤ 13 (24.4%). Seventy-four percent of patients with post traumatic seizure had GCS ≤ 13. The chi-squared test results showed a significant correlation between moderate and severe head injury (GCS ≤ 13) and post-traumatic seizure (P Value = 0.005). Table 3 shows symptoms and sign of patients with RTBI. Eleven patients had abnormal CT scan findings (26.9%). Table 4 shows CT scan findings in patients with RTBI. Out of 41 patients, 15 (36.6%) with abnormal CT scan had post-traumatic seizure. The risk of post-traumatic seizure in patients with CT scan abnormality was 5.1. The chi-squared test showed a significant relationship between CT scan abnormality and post-traumatic seizure (P. V = 0.005, OR = 5.1, CI: 0.92-28.5). The majority of repetitive brain injury studies in the world have been carried out on athletes (soccer players and boxers). The RTBI rate in athletes was 5.9% to 36% (7, 8). In this study, 2.5% of all the patients with head trauma had prior history of TBI. This rate was 4.2 % in Saunders et al. (6), 7.4% in Annegers et al. (12) and 25% in Whiteneck et al. (13) studies. Our finding was similar to that of Saunders et al. (6). In comparison to our study, the higher percentage of RTBI in Annegers et al. (12) and Whiteneck et al. (13) studies may be due to the method of RTBI assessment. Annegers et al. (12) reported RTBI in patients who had seizure after TBI using medical record review. Saunders et al. study (5) showed that seizure increased the risk of RTBI. Whiteneck et al. (13) recorded pervious traumatic brain injury in hospitalized TBI patients with using self-reports of knock out or losing consciousness in response to past medical conditions query. In addition to athletes, RTBI rate in prisoners was higher than in other populations. Schofield et al. (14) reported an RTBI rate of 62% among prisoners. The incidence of RTBI was 9.7/100,000 in our study. On the other hand, the risk of RTBI in rural residents was greater than those of urban areas, while the incidence of single occurrence of TBI in urban areas was greater than that of rural areas. Yates et al. reported that the incidence of a single occurrence of TBI in urban areas was greater than that of rural areas in UK (15) (826.9/100,000 in urban, 223.8/100,000 in rural). This can be justified with poor socioeconomic status of rural residents and lack of access to advanced medical and rehabilitation facilities for brain trauma in those areas. The mean ages in this study were 36.6 and in Saunders et al. study it was 44.4 years (6). The age range of brain trauma in developing countries such as Iran and China regarding their different lifestyles and RTA incidences is lower than developed countries (16-21). In addition, the mean age of RTBI in this study was higher than the mean age of single occurrence TBI. Rahimi-Movaghar et al. in a population study (1) reported that the mean age of single occurrence TBI was 28.7 years; 50% of patients with TBI were 25 years old and younger, while in our study 50% of cases were 34 years old and younger. The age period from birth to 24 years is called cerebral development age interval, in which brain grows up and matures completely (22, 23). According to the center for disease control (CDC) report, 51% of single occurrences of TBI occur during the period of cerebral development (22). Head injuries in this period impair brain development and cause cognitive and mental problems (23). In the present study, 25% of RTBIs occurred in cerebral development period. This shows higher risk of patients with previous injury and may also cause more future problems. Therefore, it seems to be mandatory to improve preventive strategies in communities, schools and families in this age group if it can keep the society healthy. Male-to-female ratio in the current study was 12.6:1 and males were at a higher risk in all age groups. This ratio was 2.4:1 in Saunders et al. study (6). Some other national studies (1) reported male to female ratio in single occurrence of TBI from 3:1 to 4.25:1. This high proportion was probably due to the fact that the majority of our cases were labor men from low social and economic levels, who despite their prior TBI that may have been debilitating to them, had to work and therefore sustained a head injury again. Most of RTBI cases (63.4%) had an educational level lower than high school diploma. People with low levels of education who do not usually apply trauma preventive guidelines are at risk of RTBI (6, 24). Less than 40% of cases had high school and upper level graduation. This may be secondary to brain dysfunction and inability to learn and lack of academic achievement resulting from their prior TBI (13). In Saunders et al. study, 38.1% of cases (6) had education level below grade 12. This difference may be due to difference in background cause of injuries and their repetitions and perhaps differences between Iran and USA societies. RTAs were the main causes (68.3) of RTBI in the present study. This result is similar to Saunders et al. study (6) with 41.6% of RTBI cases caused by RTAs. In our study, 36.6% of RTBI cases had previous ICU admission (prior severe TBI). Saunders et al. study (6) showed the increased chance of RTBI with prior severe TBI. After severe TBI, patients encounter many cognitive problems such as concentration impairment and visual problems (13). Twenty three (56%) of RTBI cases were drivers and 48% of them had previous ICU admissions. These worrisome results may be derived from cultural/socioeconomic poverty or psychological/personality disorders prior to TBI. In the present study, 10 (24.4%) RTBI cases had GCS ≤ 13 (moderate and severe TBI), while 45% of patients with RTBI in Saunders et al. study (6) had severe TBI. One reason for this difference is the difference in scales, which were GCS in our study and abbreviated injury scale (AIS) in Saunders’ study . Another cause may be the higher incidence of trauma in our country which results in more repeated occurrences. Epileptic persons had more injuries than the general population and 25% of these injuries had occurred during the seizures episode (25). Furthermore, head is the most frequently injured anatomic organ during seizure convulsive episodes in epileptic/seizure patients (26). Saunders et al. (6) found a significant relation between prior epilepsy/seizure and RTBI. In this study, 9.1% of cases with RTBI had prior known epilepsy/seizure diseases. This rate was 5.6% in Saunders et al. cohort study (5) and 1.6% in Annegers et al. study (12). This may be due to inadequate attention to seizure treatment and control (mostly from patients’ sides) or inappropriate legal preventive guidelines for epileptic patients in our country. In our study, 7 (17.1%) cases with RTBI had post-traumatic seizure episode(s). In addition, there was a significant correlation between TBI severity and post-traumatic seizure. According to Annegers et al. study (12), patients with severe TBI had a higher risk of post-traumatic seizure than those with mild TBI. Considering the high incidence of trauma in developing countries, RTBI may also be more common compared with developed countries. This mandates a newer approach to preventive strategies, particularly in those with a previous experience of head injury. The authors would like to thank the physicians of emergency department of Kashan Shahid Beheshti hospital. Authors’ Contribution: Esmaeil Fakharian: study design, revised the draft; Mahdi Mohammadzadeh: study design, data analysis, draft writing; Shirin Behdadmehr: data collecting, study design; Hamid Reza Saberi: study concept; Azadeh Sadat Mirzadeh: data collecting; Javad Mohammadzadeh: data collecting. Financial Disclosure: This study was a part of a M.D dissertation supported by the trauma research center, Kashan University of Medical Sciences. Funding/Support: Trauma research center, Kashan University of Medical Sciences supported this study.